Recently we’ve become completely hooked on the HBO show ‘Curb Your Enthusiasm’, brought to us by our friendly local DVD lender. I don’t know why it’s so much fun to watch people who have too much money for their own good make fools of themselves, but we find the show absolutely hilarious, even with its predictable plot lines: Larry runs into somebody unknown at the beginning of the show, Larry says or does something stupid in front of this person, this person shows up later in the show as an important character, vindictively embarrassing Larry in front of everyone he knows, a big chaotic mess ensues, and Larry ends up the idiot. Side-aching stuff. But what I’ve noticed, as of course I can’t watch a show and not notice the references to food, is that nobody on this show ever cooks. They eat out constantly, which admittedly I would probably do too if I had millions to burn, but every so often they do something homely like have people over for dinner. Instead of whipping out the Larousse and proving that film-god status and kitchen-god status can coexist in La-La land ("where do you find the time to cook with your hectic filming schedule? "), they invariably have the whole thing catered, even if it’s just a small intimate affair. I mean, I suppose I understand: you wouldn’t want to drip bacon grease on your Jimmy Choos, now would you? I find this a very sad state of affairs, because preparing a dinner for friends is one of the most pleasurable things I know. Of course I enjoy the part of having them over and talking etc etc, but for me the fun of the whole event is amplified a hundredfold by having the cooking to occupy myself with beforehand. In fact, I find the preparation usually follows a predictable dramatic pattern, not unlike an episode of ‘Curb Your Enthusiasm’. The theme is introduced by fervent cookbook reading, menu planning and shopping-list writing days ahead of time. The shopping commences with audible tension – Will I find everything I need? Will I forget to buy something essential? The crescendo of panic, as I realize that no, they’re out of the main ingredient and hastily phone Manuel to beg him to stop at the bigger, better supermarket on his way home from work. The momentary relief as we manage to locate everything we need, only to be replaced by the buildup to the final climax, the tense drama of preparation – Will these recipes work? Will I finish cooking in time? The resolution, as everything is pulled off seamlessly, guests ooh and aah and I wipe that little trickle of sweat from my brow before anyone has even noticed it was there. Okay, maybe a little more melodrama than your typical episode of CYE, but this is real life, right? So last night I put my thespian skills to the test for a couple of our friends with a carefully planned multi-course extravaganza. All the dishes I made were based more or less faithfully on recipes from Crazy Water, Pickled Lemons. The following recipe was our overture for the meal, a gem of a soup, and perfect, I would imagine, for hot summer days. Chilled soups are great to make for dinner parties because they have two diametrically opposed yet complementary characteristics: (a) guests love chilled soups because they’re out of the ordinary, and (b) chilled soups are a breeze to make, being prepared hours ahead of time and left to do nothing but mellow out in the fridge until your guests arrive. Start by sauteeing the onion and leek in 2 tablespoons of the oil over medium heat until they are translucent and soft. Add the garlic and cumin and cook another minute or so. Add the stock, cayenne pepper, mint and coriander stalks, and simmer for fifteen minutes. Remove from the heat and let cool until lukewarm. 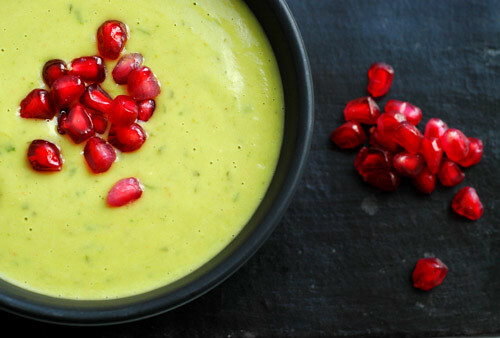 Halve the avocados, scoop out the flesh and add it to the soup with the cilantro leaves, lime juice and remaining two tablespoons olive oil. Puree everything with your hand- or normal blender. Stir in the greek yogurt, adjust the seasoning, and chill until cold, at least 2 hours. Serve with a sprinkling of pomegranate seeds and another dollop of greek yogurt, if you like. *the pomegranate seeds were a last-minute addition for aesthetics’ sake, but I thought they went really nicely with the tart, creamy soup, and next time I make this I will definitely add them again. *that’s French for starter, by the way, not American for main dish! hello melissa! i have to admit that when i am in los angeles, i fully intend to make use of my kitchen, but i am completely distracted at every turn by the choices of restaurants and cafes at every corner–there is so much to explore! i don’t really watch CYE (too uncomfortably real life), but i would’ve thought they would be one of the many folks in la with a private chef at home. i would love to see an episode where larry david freaks out at an organic farmers’ market–urrgh! why are all these vegetables so dirty?! !i have been eyeing crazy water, pickled lemons for several months now–i’m looking forward to seeing your other dishes. hi santos! at first we also found CYE a little too real-life for comfort, especially as manuel used it as an excuse to poke fun at all the over-the-top americanness, but somehow it grew on us. i think your description of larry david at a farmers’ market is hilarious! and i must say, if you’ve been eyeing crazy water for a while, and you like this type of food, i wouldn’t wait any longer. rarely do I gush about a cookbook ad nauseum like this – it’s simply fantastic. thanks for stopping by!hi sam, LOL! i would have probably stopped speaking to anybody who heated up my gazpacho. you’re obviously a more tolerant person than i… but maybe it’s time to give cold soup another try? maybe your circle of friends has matured a bit in the meantime! I’m very much grateful to you for providing the recipe. I tried that in my sis party, it’s delicious & everyone likes it.